As the lawn mower engine burns gas inside the cylinder it generates an enormous amount of heat. This heat must disperse out of the engine to keep the temperatures cool enough to maintain the proper pressures for all the moving systems on the lawn mower. 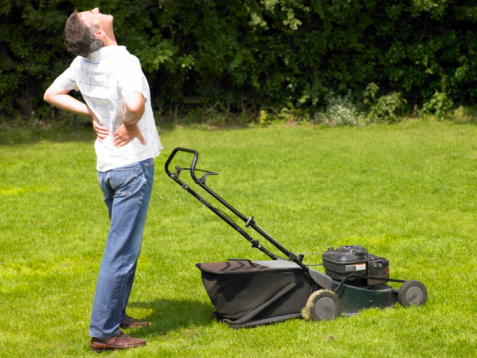 When a lawn mower stalls after heating, generally too much heat or pressure has built up in the engine. Lawn mower in center of grass. A simple, often overlooked, trigger for an engine stall occurs when the heated gases inside the fuel tank can't vent properly. The pressure causes the gas flow to reverse and move out of the carburetor, effectively shutting the engine down. Often referred to as vapor lock, the engine can't operate with these heated gases trapped inside the tank. 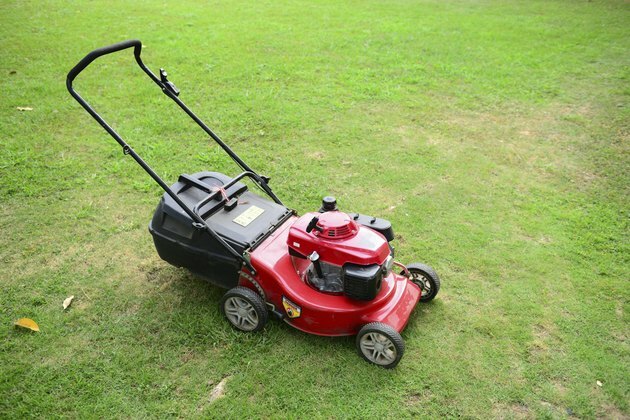 On lawn mowers, most vapor lock occurs through a dirty fuel tank cap. These caps have a small vent hole that allows the tank to maintain the proper pressure. Clean or replace the fuel cap. Problems in the supply of fuel and lubrication will cause an engine to shut down, especially as it starts heating up. Always check the fuel supply before each use. Dump out any gas older than 30 days, as it will go bad and clog up the fuel system with a sticky substance. If you used bad or old gas in the engine, the problem may require a thorough cleaning of the fuel tank, replacing the fuel filters and fuel hoses. Always check the oil supply as well and add more oil as needed. Change the oil after every 25 hours of operation. When bad or old gas goes through the carburetor it starts leaving behind a gummy deposit. This deposit, as it builds along the hoses and inside the carburetor, will gradually choke off fuel arriving to the carburetor. If the carburetor doesn't get enough gas the engine will shut off. Problems in the carburetor, such as a stuck intake needle, will restrict the fuel. Remove the carburetor, disassemble and clean it thoroughly. Install a carb kit before reinstalling the carburetor. When the engine can't vent the heated gasses from the internal combustion or take cool air in for the next stage of combustion, stalling can occur. Air comes in through the air filter and goes out through the muffler. The air filter gets dirty quickly, so clean it every eight hours of operation. Clean the muffler after every 60 hours of operation. Replace either the muffler or air filter if it's too dirty to clean.